You're the right page if you want to know the meanings of "admission in progress", meaning of "not admitted" meaning of "sorry no admission is given yet. Now that all is set for this year admission exercise, you need to know that JAMB is now in charge of giving you admission. 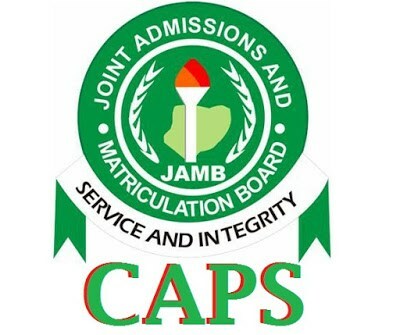 JAMB will use the system called CAPS to give you admission. Read, UTME is Over! What Admission Aspirants Should Be Expecting in Few Weeks to get idea of next stages in admission, after you'd checked your UTME result. Also note that this same information affects the Direct entry admission aspirants. In full, it is Central Admission Processing System. This system is devised by JAMB to monitor admission progress of all admission seekers. The primary purpose of this mechanism is to monitor your admission by JAMB so that schools don’t deprive you offer when you merit one. JAMB gives you regular access to your profile so you can see how things are going between your proposed institutions and the body. First, do you remember that you created a profile during the UTME registration exercise? You will need this from now till you’re finally given admission – even after. That’s how CAPS comes in. Now that you have your profile handy, let’s me work you through how you will use it to access your CAPS. If you can’t access you profile again because you forgot the password, kindly reset your password. Follow the link below your profile. A password reset link will be sent to the email you used during UTME registration. Enter a new password you won’t forget and submit. Now re-log in to see that the new password is working with your profile. Now that you’re able to log into your JAMB profile, you should be able to see CAPS at a corner side of your profile dashboard. NOTE: This CAPS link will only show when the admission processes start not before then. So if you don’t find it there right now, it may mean admission process has not started from the JAMB end – kindly check back. Then click the status link to see your fate. You need to be able to interpret different messages that will be displaying to you as soon as you check your status. Below is the list of those messages and their interpretation or meaning. Some candidates complain what they see on their profiles is only the word “Welcome” and nothing more. Interpretation. Your device can’t display more contents than that. In other words, you should know that the page show you more than the word “welcome”. But if that happens to you, your device (usually a phone) can’t show you the rest details. What to do next. Change your device and log in again. I advise you use a computer to check. You can also mark the "Desktop Site" box in your browser sitting to see the page in the standard desktop view. This is a message to tell you that no school has offered you admission yet. Interpretation. It doesn’t mean you won’t be given admission. It only shows no admission is yet to be given by any school. What to do next. Wait for your proposed schools to conduct post UTME or admission screening (if they’ve not). If they have already, they usually continually send lists to JAMB to upload to students' pages. Hence, you will be checking your page from time to time to know when it’s your turn. This means JAMB has received your name for admission but they will need to verify some criteria followed by the institution to ascertain their conformity with lay down rules. Interpretation. Be happy this is the beginning of your journey to being admitted. I can guarantee if you have this status message, you’ll be offered admission at the end. What to do next. Wait for JAMB to complete her work. Keep checking your status from time to time and sooner the message will change to the next stage. 4. 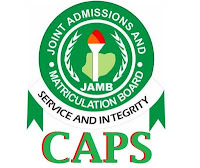 CAPS "You are recommended for Admission"
This message is a double assurance that JAMB has received your name in the list and you should be rest assured of the admission. Interpretation. Your school has offered admission but JAMB will have to consent it too. At this stage, the body can change your course to another if you don’t meet up with your original proposed course. What to do next. You wait and keep rechecking until your message change to a congratulatory message. This is the congratulatory message you have been waiting for. Once, you’re shown this message, no going back. Interpretation. Even if this message doesn’t say what course is given or which school gives, you’re still certain you have been offered admission. It may take a few days before other details are shown. What to do next. Check back for messages that will display which school and what course you’re offered. Just recheck your profile from to time. This time, JAMB wants to be sure you want to accept or reject the admission. This is a very sensitive stage. JAMB doesn’t want to give you admission and later you don’t have interest in it again. This will deprive a student who wants such an opportunity to be admitted instead of you. Hence, they want you to confirm that you want the school and the course offered. Interpretation. Don’t joke with this stage. JAMB may eventually withdraw your admission if you don’t accept the offer. In fact, you won’t be able to print JAMB admission letter unless you accept the offer. So, accept the offer if you’re ok with that or reject it to give another student a space. What to do Next. If you accept, print your JAMB admission letter and wait for your school to upload your list to the school’s portal or call you up for documentation. If you reject the offer, you will have to wait and keep rechecking your status to see if another school will give you admission. 7. CAPS "Congratulations, you’ve been offered Admission"
This is what you most likely see after you have accepted the admission or sometimes before. Interpretation. This reassures you that, nothing else is expected of you on the JAMB profile unless you want to print original JAMB result, admission letter or do change of course (if your school offers you a course different from the one you chose in UTME). You will be required to do change of course if the course given to you is different from the one you filled during the UTME registration. Without that, you won’t be able to print JAMB admission letter. And both can be printed from your JAMB profile at a price of N1000 each. Also, change of course payment is N2500. Most students ask me whether it's possible to have admission offers from two or more schools with this system. I had done some justice to this question in my post, "Can JAMB give admission to a Student from two Schools or More?" Of course, some candidates never understand what CAPS is all about. You can help them know by sharing this post with them now. Use the share links/icons below.